Reaffirming strong cooperation in nonproliferation efforts, the United States of America today said Kazakhstan has displayed extraordinary leadership in curbing nuclear proliferation in the region and around the globe. In his opening remarks at Nazarbayev University in Kazakhstan, Assistant Secretary Robert O. Blake, Jr. for Bureau of South and Central Asian Affairs says on nonproliferation cooperation and nuclear security, Kazakhstan’s record stands second to none. He says in the 20 years since the Semipalatinsk nuclear test site was closed, Kazakhstan has established itself as a world leader in the fight against the threats of nuclear proliferation and nuclear terrorism. In addition, Kazakhstan has eliminated or removed from its territory all nuclear warheads, completely dismantled the infrastructure of the Semipalatinsk test site, and destroyed or removed hundreds of missiles, bombers, and tactical nuclear warheads. 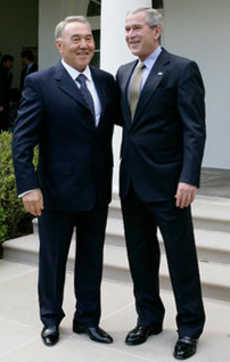 Kazakhstani President Nursultan Nazarbayev with U.S. President George W. Bush. Mr. Blake underlines that the United States has been proud to support these efforts through the Cooperative Threat Reduction Program. Kazakhstan stands as a powerful counterexample to Iran. According to Mr. Blake, Kazakhstan stands as a powerful counterexample to Iran, where the international community has serious and legitimate concerns about the nature of the regime’s nuclear activities. Both countries are serious about efforts to seek a diplomatic resolution, and our Government has made clear publicly and privately that they believe there is time and space for diplomacy, and that is why, with Kazakhstan as a gracious host, US continued its engagement with Iran in two rounds of P5+1 talks in Almaty. The US recognizes Kazakhstan’s efforts as two countries deepen bilateral relationship. In 2012, both countries upgraded relationship with Kazakhstan to a Strategic Partnership Dialogue. According to Mr. Blake, President Obama personally expressed his appreciation and support for Kazakhstan during his meetings with President Nazarbayev at the Nuclear Security Summits in Washington in April 2010 and in Seoul in March 2012. In addition, the US attaches a great deal of importance to expanding educational ties, exchanges and dialogue with Kazakhstan’s young people. In the past academic year alone, 1,859 Kazakh students studied in the United States. Mr. Blake cite some of these young people have participated in exchanges such as the Fulbright, Humphrey, and UGrad programs. Others are part of the prestigious Bolashak program sponsored by the Government of Kazakhstan. This dynamic, growing relationship in education is part of a broader partnership between the two countries, Mr. Blake said. The U.S. partnership with Kazakhstan has grown dramatically over the last 20 years, as Kazakhstan has become a regional and increasingly global leader. 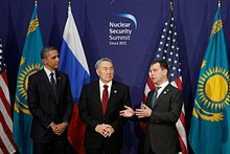 Nazarbayev with Barack Obama and Dmitry Medvedev, 2012. Kazakhstan served as Chair of the Organization for Islamic Cooperation in 2012. It was Chairman of the Organization for Security and Cooperation in Europe (OSCE) for 2010 and is on the cusp of joining the World Trade Organization. In addition, Kazakhstan has taken the lead in Central Asia in embracing the vision of regional integration. In November 2010, Kazakhstan safely shut down the BN-350 plutonium production reactor in Aktau. It has secured approximately 100 tons of weapons-grade spent fuel and transported the spent fuel to a new secure storage facility in Eastern Kazakhstan. In securing enough nuclear material for 800 nuclear weapons, Kazakhstan, under the leadership of President Nazarbayev, has made a significant contribution to global security and nuclear nonproliferation. The United States commended the dedicated team of hundreds of Kazakhstan and U.S. scientists, engineers, and safety, security and transportation experts who worked tirelessly to accomplish an extremely difficult and ambitious undertaking with the highest standards of safety and security. United States also thanked United Kingdom for its contribution to the later stages of project. The completion of the program is one of the many highlights of the 15-year track record of partnership and close cooperation between Kazakhstan and the United States in reducing nuclear threats in Kazakhstan and around the world. The United States welcomed efforts to intensify the bilateral partnership with Kazakhstan and promote international cooperation on nuclear safety and nonproliferation. The activities were conducted in accordance with U.S.-Kazakhstan Presidential Joint Statements in 2006 and 2010 and the goals of the 2010 Nuclear Security Summit this past April in Washington. At the new long-term storage facility, the BN-350 spent fuel will continue to be under International Atomic Energy Agency safeguards.